Remember the saying where it states that “there is always a woman behind a great man”? Oh well, a film directed by Pascale Lamche was all about great, strong, determined and a fearless woman who spent decades in a fight to release her husband Nelson Mandela from prison. She made so many sacrifices, had to see many lives lost, face trial and an unfair one at that yet she stood tall. She cemented her name in the history of South Africa, and in my eyes she’s a woman without whom Nelson Mandela would most likely and most assuredly would have never been released from prison. Winnie Mandela when we find her is happily married to Nelson Mandela, a man who many years later, when he will be an old man, is to become the president of South Africa. But before it happened, there was only one person who fought for him in every field possible. She was demonized, her reputation was vandalized, but as an activist and a person who believed that the only person who can free South Africa from the racist regime will be her husband, she continued her fight. 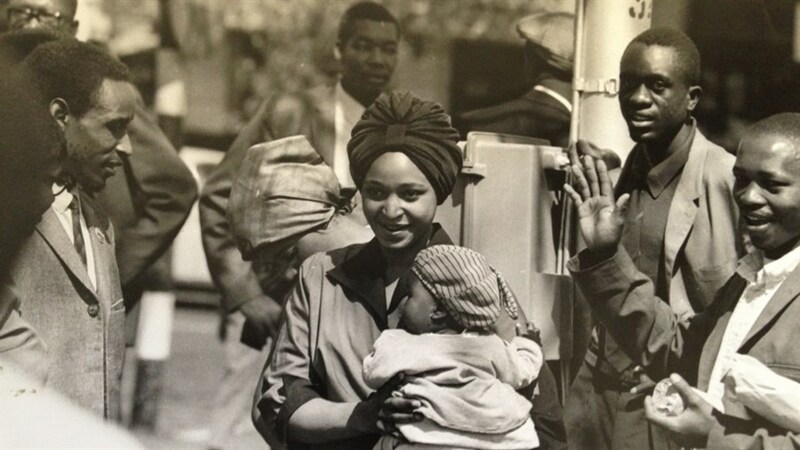 As the story unfolds through remarkable archival footages, we see Winnie everywhere. As a Member of ANC (African National Congress), through the difficultness of situation faced due to police interrogation, assault at a member’s committee, this incredible woman would continue her journey through every single barrier created by those who wanted to silence her. But the whole problem is, the image created by Winnie was much louder than the campaign for Nelson Mandela to be forgotten. And he would have, oh trust me on that, he would if not this woman whose name you and everyone from now on should always remember. As you watch this brilliantly, simply stunning and captivating docufilm, and the way Winnie gives her interview, you simply fall in love with her, her spirit, her endless energy, her free will and contagious belief you would love to follow. By looking at her, you most certainly notice why government was afraid of her more than Nelson Mandela. And why the same government wanted to demonize her before everyone’s eyes. But one thing as the film will be concluded, you will never be able to comprehend is that how could it be possible that after so many years of constant fight for her husband’s freedom, Nelson Mandela, due to any reason divorce the woman who was wrongly accused for the only crime she ever committed – to liberate her country from racism and free them from horrifying regime? In conclusion, Winnie is a documentary about a strong woman. It’s intriguing, engaging and well structured. The footages you will be seeing will amaze you as if you were a part of history. But we were, more or less… But it’s a great tribute to be paid to a woman who should have never been underestimated, because as history proves she indeed was the most influential person in the entire world than all men put together. And for that we all should be thankful to her for not stopping her fight for what she believed in….